Successful investing is about patience and seeing the bigger trend. Netflix (NFLX) changed the way we consume media, and it became the first global network. After the closing bell on Tuesday, the company released gangbuster third-quarter financial results that sent the stock into the stratosphere. Just 90 days ago, many traders were writing the obituary for the Silicon Valley company. The lesson for investors is clear: Be patient. Netflix is a great American success story. The company began way back in 1997 as a mail-order DVD rental company. It is hard to believe that only 21 years ago, this was an exciting, innovative business model. Times have changed. But back then, Netflix was like a hurricane. The company figured out how to remove friction from the Friday night trip to the video rental store. It swept away all the procedural bits people really hated — like wandering the aisles and paying late fees. Then at the apex of its early popularity, Reed Hastings, the company founder and chief executive officer, completely changed course. He and his managers went all-in on digital. They turned Netflix into a software business. The process was not easy. The technology was not sitting on some shelf somewhere. Hastings and his team had to build most of it from scratch. They had to convince media publishers it was in their longer-term best interests to allow consumers to gorge on streaming, as opposed to selling shrink-wrapped media at electronics stores or DVD rental shops. Subscriber growth alone can support its content investments. But Netflix is building another massive revenue stream with data analytics. It was a tough sell. But Hastings had a plan. He could see Netflix had the potential to be something magical. The emergence of alternative platforms, like gaming consoles, meant wider reach. When smartphones hit the scene years later, the market grew exponentially. Netflix was suddenly everywhere. When the platform became ubiquitous, critics complained about the lack of quality content. When Netflix began to strike deals with high-profile studios and producers, naysayers pointed to the risks. If content providers bolted, the whole streaming empire might implode, they argued. When the company began developing content, critics warned about costs and burn rates. 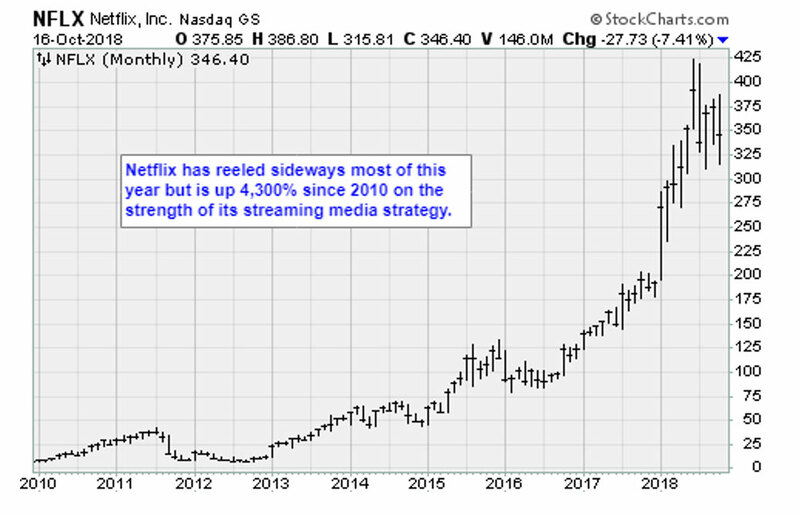 Naysayers are wrong about Netflix. They miss the bigger picture. The future of media consumption is on demand, everywhere. Netflix — with its relatively scant monthly subscription fee, voluminous library and flawless technical execution — is a cord-cutter’s dream. Subscriber growth alone can support the content investments. The company had made extensive investments in predictive analytics. Netflix algorithms track which programs its customers watch, and for how long. Software measures how they navigate the site. When the company invested $100 million in the original series “House of Cards,” product managers already knew the deal made financial sense. It appealed to many core network demographics. More important, mangers knew the series would strengthen network effects. As networks grow, they self-perpetuate. You see a program on Netflix you enjoy. You tell a friend. They get a Netflix subscription. Third-quarter financial results showed revenues grew 36% year-over-year, to $4 billion. The company added a staggering 6.96 million new subscribers. Domestic users vaulted 1.09 million, 400,000 above the consensus expectation. And Netflix is projecting 9.4 million new subscribers in the fourth quarter, as more blockbuster original series show up. In after-hours trade on Tuesday, Netflix shares gained 15%. 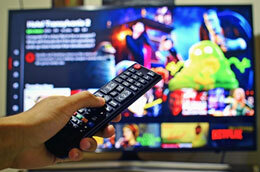 There is still a worry that competing streaming networks will siphon away subscribers. Disney (DIS), with its considerable cache of media properties, will start streaming its catalog in 2019. Undoubtedly, it will be a formidable service. But it will complement Netflix. Cable TV providers should be shaking in their boots. The days of shoddy service and expensive monthly bills are coming to an end. Netflix had $11.7 billion in sales during 2017, an increase of 32.4% year-over-year. Given fourth-quarter subscriber guidance, those numbers will be dwarfed by fiscal 2018. Shares are up 80% in 2018. The market capitalization is $145 billion. Believe it or not, given the potential of on-demand, this valuation seems low. Investors should use any weakness to build long-term positions. 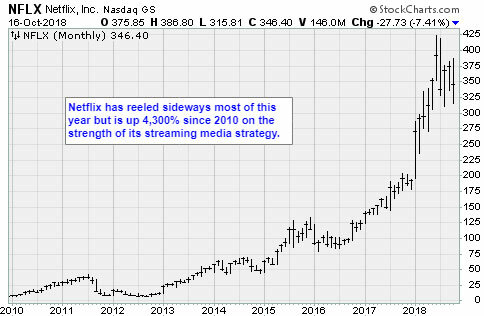 For my specific guidance about stop-losses and profit targets for Netflix and other stocks that offer “streaming” hot profit potential, take my Tech Trend Trader service for a test drive. Click here to get started today.